Fred Hill went 941-658-7 in 30 years as Rutgers baseball coach. The news didn’t make much of a ripple in these parts, and why would it? The death of a retired baseball coach from a college in a different state shouldn’t garner headlines in New England. But when longtime Rutgers baseball coach Fred Hill died recently, a member of the Red Sox organization felt the loss to his core. And when Darren Fenster took to Twitter to share a long thread on the impact Hill had on his life, when he shared the way Hill hadn’t just coached him into an All-American in college but guided him into a post-playing life as a coach, the Red Sox minor league outfield and baserunning coordinator opened a powerful window into the ways in which a good coach can change your life. It reminds me that covering a good coach can impact your life, too. “You talk to so many guys who have very, very similar stories that I do, in the game or life in general,” Fenster said recently from Fort Myers, back instructing players at spring training after returning from New Jersey to attend Hill’s wake and funeral. You’re lucky if you do, and anyone who has played sports at any level understands this truth. Encounter the youth coach who emphasizes winning at all costs, who yells at mistakes during practice, who reserves the best plays for the best players, who values results over instruction, and find a kid who doesn’t want to play much longer. But find the coach who truly is a teacher, who gives every kid a soccer ball at practice, who takes time with each player and underscores all lessons with positive reinforcement, and find a kid who can’t wait to get to practice, who’s planting the seeds for a lifelong love affair with teamwork, activity, and fun. Find that coach, and find the kid who might just be lucky enough to play long enough to encounter a mentor like Hill, whose belief in doing things the right way, whose emphasis on fundamental skills on the field and a “we over me” attitude in the dugout didn’t just win games, but won hearts and minds, too. “I find myself all the time . . . things that I say, things that I do, are things he said and things he did,” said Fenster, who managed the Red Sox’ Double A Portland team in 2018 and Single A Greenville from 2014-17, winning the league’s Manager of the Year award in his final year. “He was a very honorable man, had character, expected his players to have character, held us to a high standard. That’s been the core of my approach. If I’m going to expect players to act in a certain way, I’m going to act that way myself. Though Fenster still lives by some of his favorite Hillisms as a coach — “If you’re on time, you’re late,” “Effort is non-negotiable,” “Take advantage of what you have instead of complaining about what you don’t,” “I yell because I care” — his favorite anecdote has almost nothing to do with baseball. When Fenster’s pro baseball career — he was chosen by the Royals in the 12th round of the 2000 draft and got as high as Double A — ended abruptly because of injury, Hill created a position on the Rutgers staff, seeing something in Fenster the player hadn’t yet seen in himself. During that first season together, in 2006, Fenster kept noticing Hill do something strange at the end of the staff’s daily post-practice meeting. “Coach Hill, in his 70s, would be down on all fours, with his fungo in his hand, trying to grab something that had fallen behind the bench in the dugout,” Fenster recalled in that Twitter thread. “I kept thinking it was a pen or something until I actually realized what he was doing. There wasn’t a part of the profession Hill minded doing. While Fenster was busy playing baseball for Rutgers, I was getting my sportswriting start at The Daily Targum, the school’s newspaper. As a fully incorporated, student-run daily publication (Monday to Friday), the Targum offered an incredible opportunity to cover Division 1 sports. For an avid fan of baseball like myself, there was no better place to start than sitting in the hidden bleachers over on Livingston Campus, where the swirling winds could make a spring afternoon feel like winter, and keep score of a baseball game. 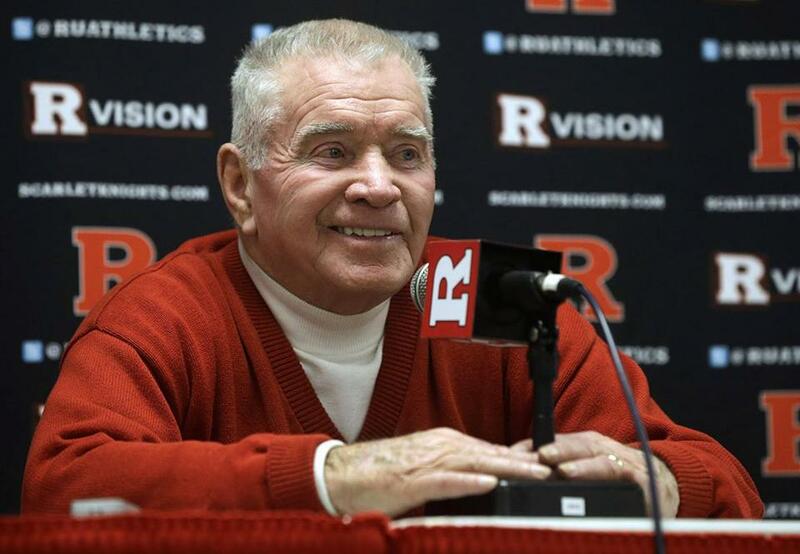 Coach Hill was as welcoming, respectful, and interesting a coach as any I ever met at Rutgers. He never cared if you played the game or if you didn’t, just that you enjoyed it and wanted to understand it. At the time, I didn’t realize how rare that could be. Over time, like Fenster, I appreciate it more than ever. Well done, Moose. Rest in peace.